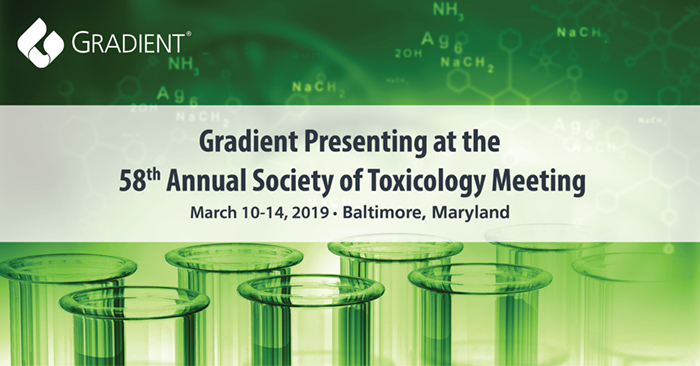 The 2019 Annual Meeting of the Society of Toxicology (SOT) will take place March 10-14 in Baltimore, Maryland. Click the links below to see the presentation abstracts. in vitro Data in Exposure-Duration Extrapolation"
"Strategies and Innovations for Addressing the Requirements of Proposition 65 and Other Consumer Product Regulations"
"Updating the Delaney Clause: Mode of Action Considerations for Carcinogens"
To be presented in the roundtable "The Delaney Clause, from 1958 to 2019: Making the Model Relevant"
in vitro and in vivo Studies"
"Critical Evaluation of Human Evidence for the Potential Reproductive and Developmental Toxicity of Nickel and Nickel Compounds"
"Considerations for Grouping Different PFAS Together to Develop Guidance Values"
"Evaluation of the Carcinogenic Mode of Action for Tetrachloroethylene and Proposal for an Occupational Exposure Limit"
"Evaluating the Impact on IQ of Short-Term Increases in Blood Lead Levels"
"Comparison of Lung Cancer Risks from Environmental Exposures to Arsenic and from Those Associated with Medical Monitoring Criteria for Smokers"
"Critical Review and Synthesis of Animal Toxicity Studies of Talc"
Click to see more information on the SOT Annual Meeting. Copyright 2019 Gradient. All rights reserved.